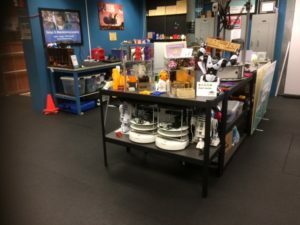 For your safety, the safety of those around you, the safety of the space and to make sure you are successful and have fun making things, most of the tools in the Robot Garden workshop require a safety and basic use or SBU class to use. We try to offer each class at least once a month so you don’t have to wait too long to get started. Please check our meetup page to see when the next classes are scheduled. SBU registration is free for members (material fees still apply) and are at a nominal cost for non-members. Learn to use Robot Garden’s 40W CO2 laser cutter / engraver. We will cover basic shop safety, but not general tool use (which is covered in a separate SBU), and the safety, operation, and emergency procedures that you will need to know in operating our FullSpectrum 20″x12″ 40W CO2 laser. After taking this course, you’ll be checked off to use the laser for your projects. Please check our meetup page to see when the next class is scheduled.